We haven't had much luck getting Warm Showers host homes so far on this trip. 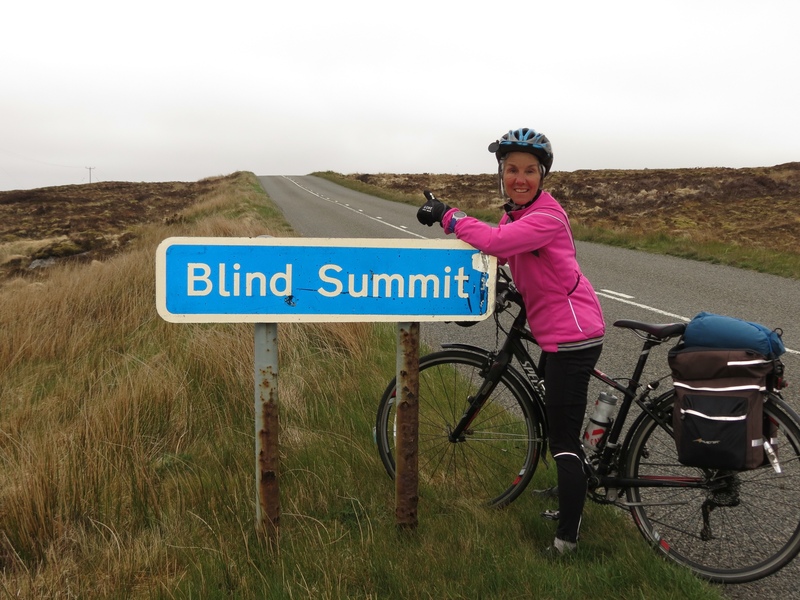 We miss being able to meet locals and getting good cycling advice. So when Barbara invited us to tea, even though go she wasn't able to host us, we immediately took her up on the offer. She lives on the outskirts of Stornaway so it was a short jaunt to her house, which turned out to be a lovely white cottage with a rural view. By the time we'd finished our introductions, we felt at ease and knew we were in for a good visit. Seated at a wooden table smoothed by the years and one side jagged with the natural grain of the wood, we were surrounded by white walls hosting open shelves and all manner of kitchenware. Opposite was a cozy sitting area, with a small fireplace and knitting in progress by the settee. Over the promised tea and some chocolate biscuits our education began. 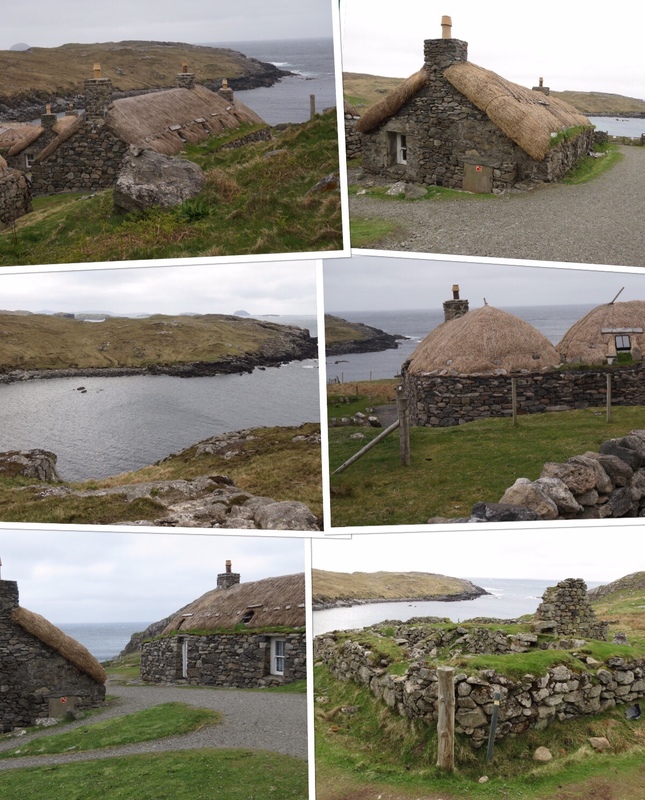 A simple question about “Crofters” prompted a passionate explanation of the landholding traditions that still exist in the Outer Hebrides and other parts of Scotland. Tenants hold rights to lands held by large trusts in return for working the land, and may pass down their rights or sell them based on more recent law. Spreading out her detailed maps, we moved on to cycling. Pouring over the roads and sights we learned which parts of Lewis and Harris, the upper most islands, we might best see. Taking her advice on a hostel and some historical sights of interest we departed with a plan for the day. During our visit, the wind had picked up and as we made our way across the island we were buffeted by the strong North gusts. The land was barren, as Barbara had warned, primarily comprised of peat bogs. We were interested to see one couple out cutting peat. Turning south along the western coast was a pleasure, as we then had the wind at our backs boosting our progress. It was chilly and there was a bit of mist in the air, rendering the landscape gray and indistinct. We nearly skipped the Norse kiln and mill that required a 1/4 mile walk. But a gentleman stopped us in the parking lot to assure us it was well worth it. Guilted into turning around, we made the windy trek and indeed were rewarded with two thatched buildings housing ancient equipment. Our final destination was Gearrannan, recommended by Barbara for the Blackhouse Village and the hostel. Little did we know that one site would supply both. The hostel was in fact one of the restored blackhouses! Excited by this good fortune, we held our breaths until they confirmed that beds were still available. Our shorter ride for the day left us most of the afternoon free to explore. Blackhouses, we learned, have thick double stone walls, thatched roofs and until more recently did not have a chimney – smoke just went up into the thatch. In addition, they housed animals as well as the family. Peat was a main heat source, and we saw a film on how it is cut and dried for use. 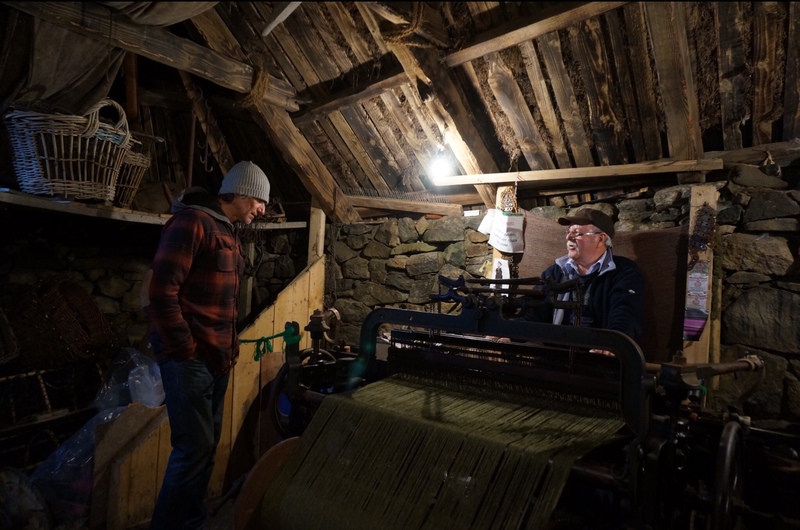 In the museum house, a man was weaving Harris Tweed, which is still produced on the island under strict control over the materials and methods used to produce the wool fabric. Wandering around the buildings, we happened on a film crew. 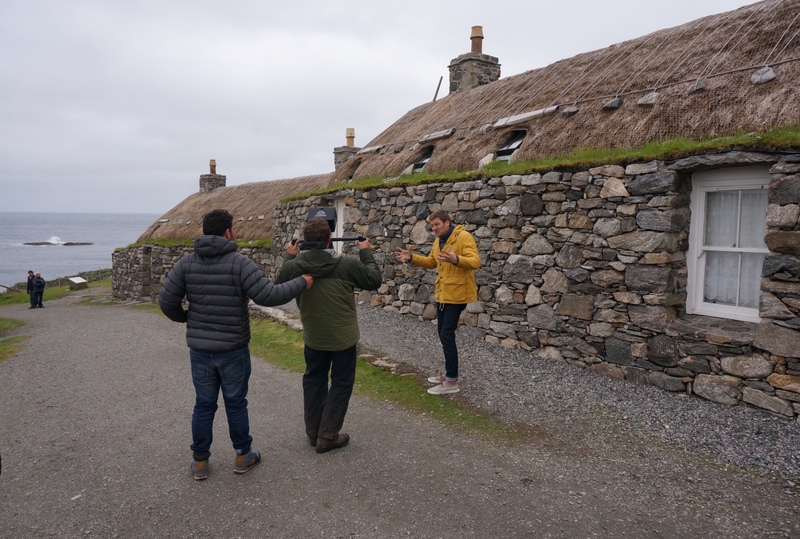 They happened to be shooting an TV episode for “Homes by the Sea,” and we stood by and watched with interest as the animated show host expounded on the construction techniques and use of these blackhouses. The best part was having free reign in the village, including after hours. There were walking trails up onto the hilltops overlooking the sea. Hiking up there I could see a fishing boat bobbing and crashing through the waves. In the distance were high mounds and eerie land formations. Sheep grazed on the squishy soft green grass, and the ever present wind whipped around me. Noting that we were on bicycles, the hostel caretaker arranged an evening meal for us as well as porridge in the morning. 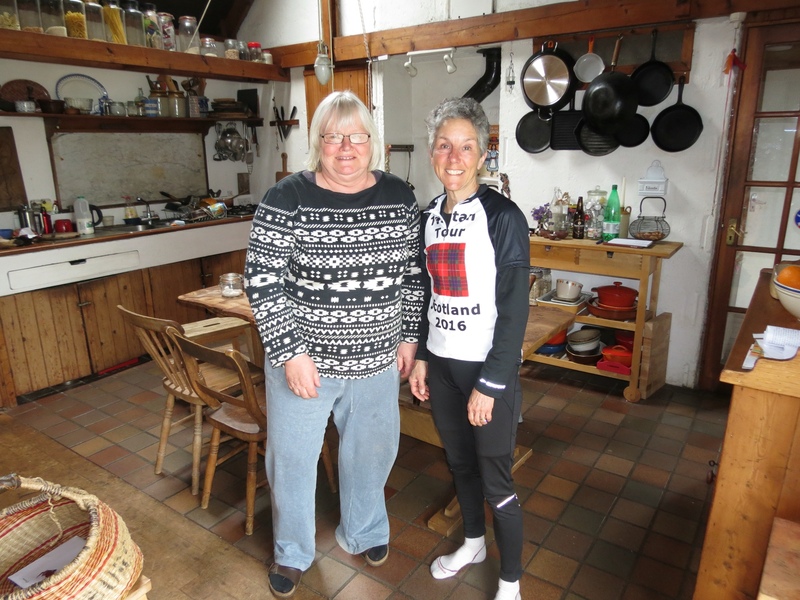 From Barbara's tea morning to living a bit of history in a blackhouse hostel we are indeed enjoying true hospitality in the Outer Hebrides.